Love, love this feature; Writer of the Month: Gauri Shinde. Besides rediscovering Sridevi with English Vinglish (2012), the Hindi Film Industry has also unearthed a genuinely sensitive and proficient writer-director in Gauri Shinde. Her first film has been equally well received by the audience and the critics. It has not only brought back Sridevi with a bang after 15 years of disappearance, but has also enabled Pune-born Gauri to claim her spot in the limelight. Did you expect the response which English Vinglish has got? Gauri Shinde: This overwhelming response wasn’t expected. You just do your work and hope people like it. What my film has got in return is pleasantly surprising. The media and the Industry, including people like Ram Gopal Varma and Amit ji (Amitabh Bachchan) have been very generous with their compliments. What was the experience of conceiving the film, first on paper and then onto the screen? There was not much of a difference. I have made the film exactly how I had written it. What I envisioned has only got better by Sridevi playing Shashi’s character. What about the coffee-house scene? It’s so simple but yet, it has become my most favorite scene. It was one thing which stayed from the first draft. I have lived in New York and that is one of the reasons why I have shot there. I go there every year at least once a year as a ritual. It’s such a vibrant city with art and culture that it’s a creative person’s paradise. It’s a lot like Mumbai. So there are ways and systems by which these countries operate which as Indians we are not aware of. They use a lot of ‘Thank You’, ‘Please’ and ‘How Are You’ while we are not used to behave like that. So such an incident, like the one which happens with Shashi, can also happen to you even if you know English. I felt it myself the first time I had to order something at a coffee shop counter. There is so little time in which one has to make an order from menus in which you don’t recognize what is what. It can be mind-boggling for someone who doesn’t know English. Actually it was one of the easiest scenes because it was true to real life experiences. I could imagine my mother or anyone who is abroad for the first time getting intimidated by such a situation. Of course, what Sridevi has given to that scene is unbelievable. I also did not want to show Americans in a bad light which we tend to do in order to portray ourselves victorious. That is why; I don’t know if anyone noticed it, I have put a dialogue which plays in the background where a guy says “Oh, this lady is in a bad mood.” So it was just a bad day for that lady at the counter. Lunch hour in New York is a crazy time and she doesn’t have time for casual talks while doing a job. So it is not like that people are rude in western countries. I wished there was a slightly longer sequence with the Michal Jackson jig! Yes, that would have made us feel that it is not Shashi but Sridevi. In fact, we never saw Sridevi but Shashi, even in that scene with Amitabh Bachchan. A huge credit goes to her for being that kind of an actor. For a star, to unlearn your stardom and be an actor; is huge. She must have been tempted to be herself at some point of time. How did you manage to get that performance out of her? She is a very intelligent and sharp actor. Of course, her acting skills are par with international levels but she also understands the script and the character. I can at least say that much after having worked with her once. We did work on the scenes but it was she who got the pitch so right. I was always on that pitch and knew what I wanted to do and she came along. I think it’s always the actor and the director finding sync when it comes to great performances. Actors depend a lot on writing and the writing depends a lot on the acting to get enhanced. It’s a collaborative process and complete teamwork. I can’t take the credit and say I have made it happen. What was Sridevi’s first reaction when you took the subject to her? What made you think of Sridevi for this character? There was absolutely nobody in my mind while writing it. I did not want to restrict myself and had kept it for later to figure out who was to play Shashi. Otherwise, you end up writing for an actor infusing his or her personality into the character. I did not want to limit Shashi but to first flash out her character and then hope to be lucky enough to find the suitable actor. It was a 40 plus woman which meant my choices were already limited. But I preferred to work that way. The doubts which you raised in the earlier question would have very much been there if it was some other producer. 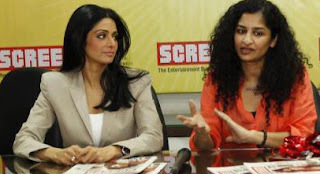 They would have said things like - It’s a woman character – It’s Sridevi after 15 years, who knows who wants to watch her – You are a debut director – There is no hero, no item number, no violence, no Masala! (Giggles) These are valid doubts even if some established director was doing it. But Balki was very protective of the script. He said “I want to be involved in this anyhow because I like it so much. Even if anybody else had come to me with this script I would wanted to be a part of it.” So the script made him the producer and the same script convinced Sridevi. The script remains the prime reason why the film has worked. The simplicity of the climax was another special feature of the script. That is how life is. Life has no great dramatic notes. And as few other people have told me, my Sur is like that. A story likes this needs a pitch like this, which is normal, simple and close to your life and my life. I can’t suddenly make guns go blazing in my film. Even in my ad films, with whatever little freedom there is, I try to bring out that simplicity. All Content Copyright © The Film Writers' Association 2012. Please read entire feature here.